A social media campaign aimed at 11 to 16-year-olds to teach them what to do in emergencies and how they can act to save lives. The campaign uses a dedicated interactive Facebook page, Twitter feed and YouTube channel to engage teenagers. The activity is supported by a dedicated microsite, where content from teen bloggers is interspersed with opportunities to learn elements of first aid. Teen bloggers including Teen baker, Celebritain, Go Girl and I-Mag have all signed on so far. 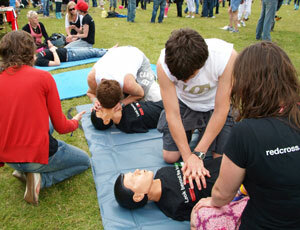 Newcastle United Football Club has also signed up to offer young people a live session to learn first aid at the club. There are also topical posts on Twitter and Facebook demonstrating the relevance of first aid to today’s teens – such as commenting on the broken ankle suffered by Manchester United’s Antonio Valencia or the broken leg sustained by Bobby Zamora of Fulham. "Our aim is to ensure that all young people and children in the UK have the opportunity to learn first aid skills and gain the confidence to save lives," said Joe Mulligan, a first aid expert at the British Red Cros. The campaign is being delivered by Band & Brown Communications, working closely with the Red Cross's in-house team. This is a simple-to-navigate microsite, engaging and well targeted at a teenage audience. The YouTube channel features situations in which teenagers could plausibly find themselves needing to use first aid, and the Twitter feed similarly poses interesting questions about real-life examples that would appeal to teens.